One of my customer told me that one of its end user was not appearing in its CUCM database. I think it is worth to make a blogpost about it. There are already plenty of resources on the subject (Example) but I will mainly focus on the troubleshooting section here. 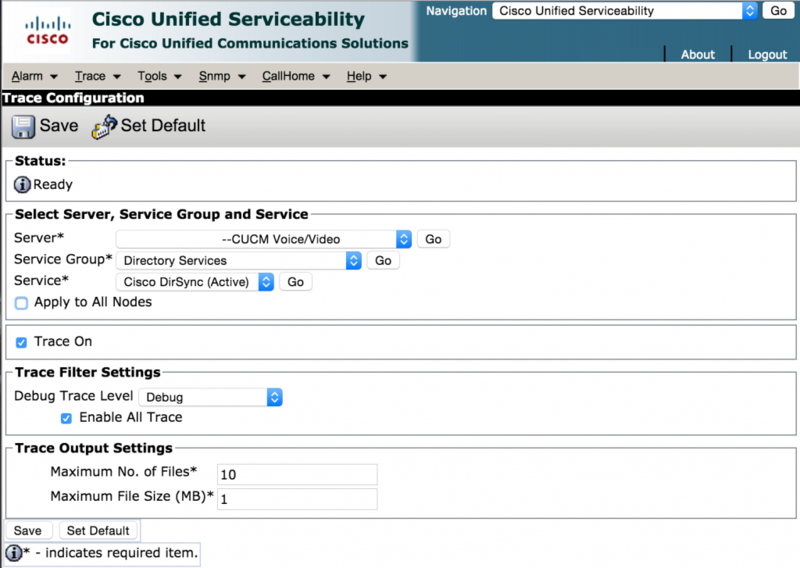 There are 2 ways to configure your users on a Cisco CUCM, you can either configure them statically or you can synchronise your CUCM with your Active Directory Domain. Search base : Where the CUCM will sync all the OU that are located at under the Search Base OU. I would advise you to use the AD “mail” field as the Directory URI CUCM field. This will be used by as a SIP URI that will be linked to the user extension. You can change this on the go if you are running 10.5.2. Otherwise you have to create a duplicate LDAP sync and then remove the old and obsolete one. Now I can check if my users are created but I noticed that indeed, one of them was missing and I would like to understand (and fix) why ! If I want to troubleshoot this, I need to activate the debugs into the CUCM serviceability menu. From here you have 2 options : RTMT or CLI. I’m not an RTMT fan so I will show you the CLI way to find DirSync logs into CUCM. [DSLDAPMain] security.Log4jEncLogger (Log4jEncLogger.java:29) - CCMENC::ERROR : Dkey decryption failed. Use recovery mechanism to decrypt data. DSDBInterface.updateUserInfo For User :roy DB ERROR: MailID entered for EndUser already exists. You can see that there is another EndUser that has the same MailID field so the CUCM does reject the synchronisation for the real user named “Roy”. There are many other reason why the CUCM can reject a user from the synchronisation process. The most common one is when you do not enter one of the mandatory field: FirstName of LastName. 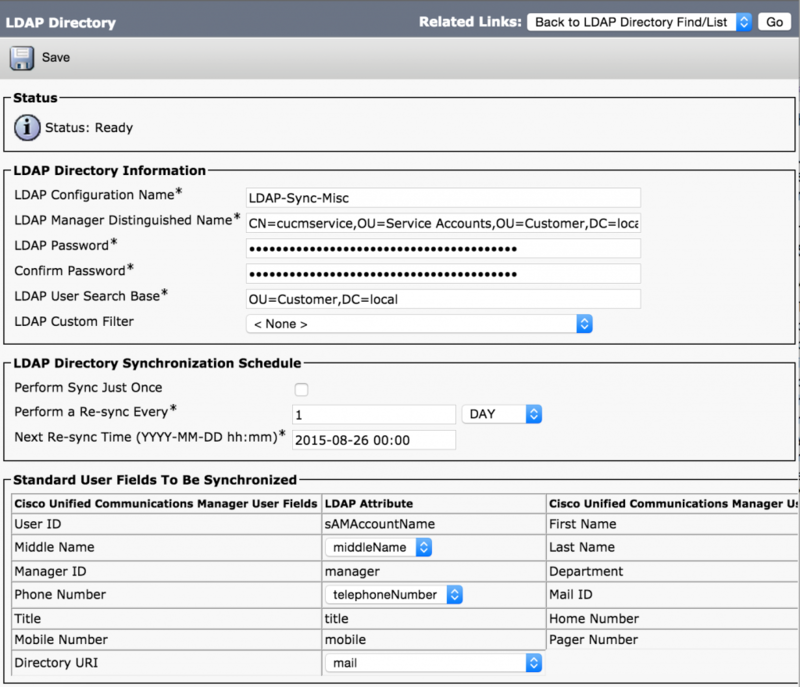 Ensure that the LDAP directory attribute chosen to map into the Unified CM UserID field is unique within all synchronization agreements for that cluster. 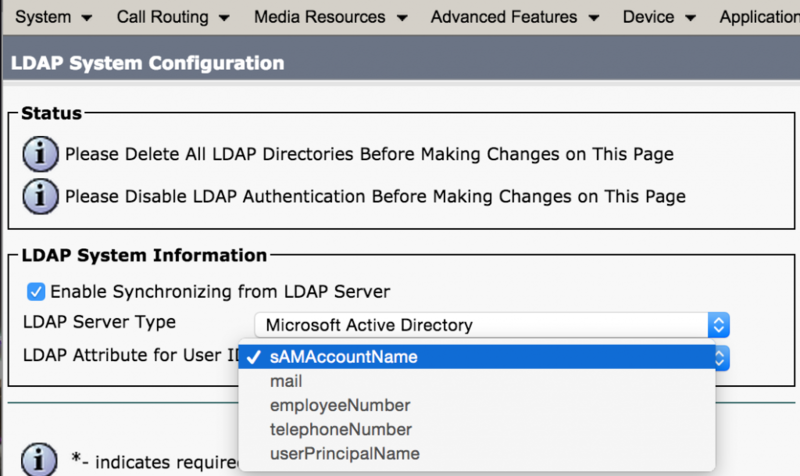 The LDAP attribute sn(lastname) is a mandatory attribute for LDAP Synchronization of users. The attribute chosen as UserID must not be the same as that for any of the Application Users defined in Unified CM. If you have any comments or questions, do not hesitate to post a comment.